Years from now, Jackson Cooke will look at the photos of himself as a child and marvel at who is standing next to him. "In the last eight months, his best friend went from being Markus Naslund to Alex Ovechkin to Sidney Crosby," Penguins forward Matt Cooke, father of 4-year-old Jackson, told NHL.com. "He thinks those are his best friends." Cooke holds a singular place as the only player currently in the NHL to have been a teammate of both the Capitals' Ovechkin and the Penguins' Crosby. Cooke played 17 games with the Caps last season after being traded to Washington by Vancouver on trade-deadline day, and this summer he signed as a free agent with the Penguins. For as long as they both play in the NHL, Crosby and Ovechkin will be inextricably linked, a rivalry for the ages, like Gretzky vs. Lemieux, Bird vs. Magic, DiMaggio vs. Williams, Chamberlain vs. Russell. Both have wracked up the individual honors, almost since they debuted in the League together at the start of the 2005-06 season. Ovechkin had 52 goals and 106 points as a rookie and took home the Calder Trophy. Crosby answered the following season with a League-best 120 points and earned the Art Ross, Hart and Lester B. Pearson trophies. Last season, Crosby provided little competition in the trophy race due to an ankle injury that sidelined him for 6 weeks. Ovechkin led the League with 65 goals and 112 points and took home the Hart, Art Ross, Rocket Richard and Lester B. Pearson trophies. More importantly last season, both played spring-time games that mattered. 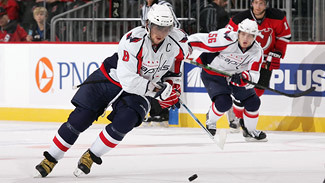 Ovechkin helped the Caps snap a three-season playoff drought by claiming the club's first Southeast Division title since 2001. After helping Pittsburgh end its playoff drought in 2006-07, Crosby captained the Penguins to the 2008 Stanley Cup Final. As Crosby and Ovechkin prepare for their 12th head-to-head meeting Thursday, they will do so on nearly equal ground in just about every conceivable situation. So the simple question was posed to Cooke: Who's better? "This may sound like a cop-out, but it's not," he said. "They're totally different people, totally different players. … Alex is a complete extrovert, outgoing, loves every aspect of any fan approaching him, and embraces that in his way. Sid is more of an introvert in that he seems to be a little more protected, but in his own way accepts every one of the fans coming up to him and signing autographs and he's patient and doing things his way. They're both accomplishing the same thing by making sure everyone is happy and do it in two different ways." As different as they may be, Cooke said both are just as good people as they are players and teammates. Cooke said he treasured the time he spent with Ovechkin last spring, especially after he was traded. After being drafted by Vancouver in 1997, Cooke had played his first nine NHL seasons with the Canucks. Getting traded was a scary, new thing for him, but thanks to Ovechkin, the move was made far easier. "When I got there and spent some time with Ovechkin, he's a guy that wants everyone to feel involved," Cooke said. "He's a really high-energy guy, a positive guy, and it's contagious in that locker room." After the Caps' playoff run ended with a first-round loss to Philadelphia, Cooke signed with Pittsburgh. And as well as he was treated by Washington's resident superstar, he received the same respect from Pittsburgh's. "It was before I got here that Sid impressed me," Cooke said. "I signed here and kind of was not out there for a couple days, but the very first second I was out there I got a text from Sid welcoming me, saying he was glad he doesn't have to play against me any more, if I need anything about where to live or when guys are skating feel free to call him. He went out of his way to make me feel welcome." On the ice, both players are workhorses. Ovechkin has missed 1 game in his first three-plus seasons. Crosby is one of the first players on the ice for practice and one of the last ones off. "The biggest thing I noticed with (Crosby)," Cooke said, "is his work ethic and determination. Any drill he's going 110 percent every time it's his turn. And that's contagious." Like the greatest rivalries, there's no real answer to the question of who's better. All we can do is be like Jackson Cooke, and just appreciate what we get to see. Said Matt Cooke: "Down the line, all the pictures we take, the memories he'll have, it's pretty amazing."